I am moving this blog over to WordPress! Come visit me there and add me to your follow list! Curt at C&T Designs is another person to whom I need to say a public "Thank you!". I buy all my niobium, bronze, and square copper rings from Curt, because his quality is so good. However, I also get rings from Curt because he is just a really nice guy. In a past post I mentioned that I was struggling with HP 3-1, an easy weave, but the dickens to get started! I also commented about my struggles on Twitter. Curt Twitters, as well, and asked me what tutorials I was using. I mentioned them, and he sent me his own tutorial on HP 3-1, which gave the absolutely clearest description that I have yet seen of the dimensionality of that weave. The tutorial helped me figure out the 3-1 weave, as you can see. These are rings that I cut, and are not up to the standard of Curt's. I wanted to try the weave with the size rings Curt recommended, and I was too impatient to order some of his excellent rings. I don't mind cutting a few rings with a jewellery saw to see if I like the weave enough to do it again, but anything more than a bracelet's worth of rings in soft copper and I go running to the store! Life is too short. Anyway, I had to try again, this time combining larger rings in copper and bronze. Next I think I could alternate them. But then I had to try helm chain, and managed that, too. I really like helm chain; it is an odd combination of incredibly easy and flat-out annoying, but the result is lovely, like a Celtic knotowrk border. Next time, though, I am buying the rings for that weave; never again am I cutting 1/8" rings with my hand saw. I have a teeny blade that gives me a nice flush cut, but oy, the labor in keeping an even cut on a weeny surface! Curt earns every penny he charges on those rings, and I am happy to pay it! Curt is also very nice about cutting custom rings for people, and doing other things (we are talking about adding a liver-of-sulfur patina to the square copper rings, as I have a neighbor who wants a bracelet with a darker finish). He's also the original seller of the anodized rainbow niobium rings. 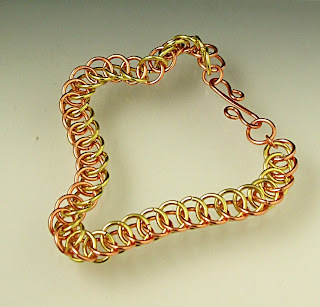 You can see the helm chain and the first HP 3-1 bracelets over at my 1000 Markets shop. One of the things I really, really like about my local ISGB chapter, "Southern Flames," is that everyone there is so helpful. We're all interested in each other's success, and everyone is just genuinely supportive. 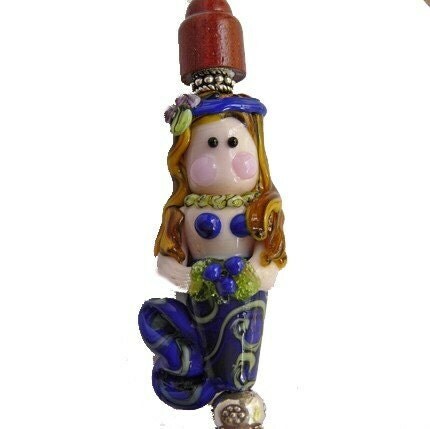 One great example is Marcy Lamberson, aka Studio Marcy, Marcy makes the most wonderful, humorous, just plain funny beads out there. 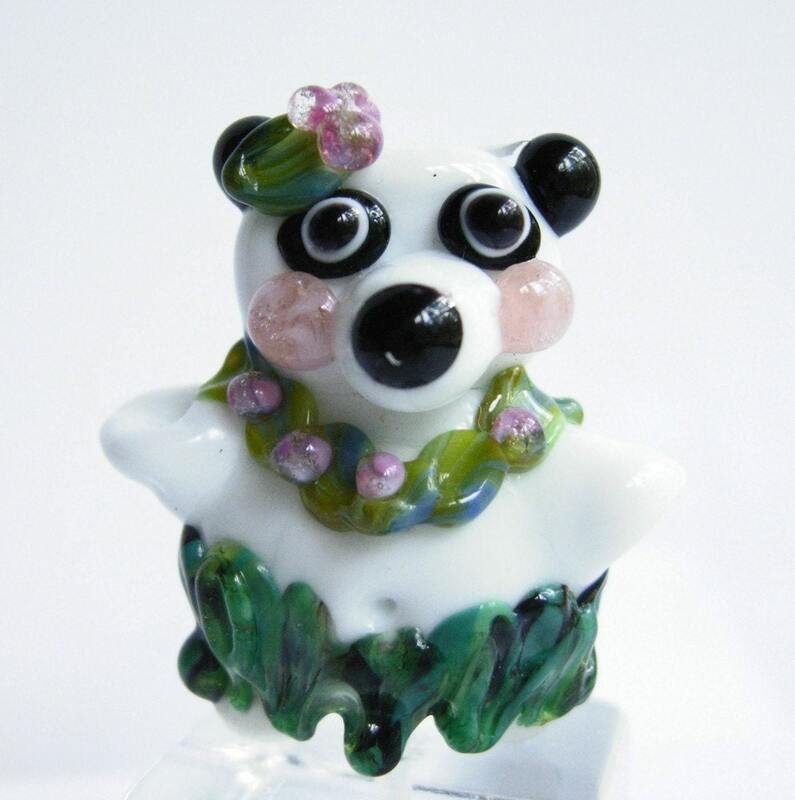 She has a fantastic sense of humor when it comes to beads -- check out Kayla the Panda Hula Dancer, or the woman who wants to be kissed under the mistletoe! Marcy is also generous of spirit, and when we are all working on beads for Beads of Courage offers mini-tutorials, sharing techniques freely--something increasingly rare. She features Southern Flames members on her blog--and I am her latest feature. 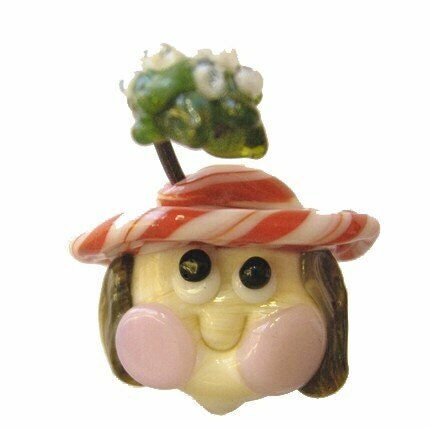 If you are in the ATL area on the 12th of December, make sure you stop by Janke Studios, where Marcy will be demoing lampwork!